On 21st January I joined tens of thousands of people on the Womens’ march on London, marking the moment of Donald Trump’s inauguration. I marched because I wanted to stand with other women for values that are utterly divorced from those of the new American President. It was a truly exhilarating day, meeting women representing all ages and so many organisations, united in our stand for equality, dignity and justice as well as peace, cooperation and hope. 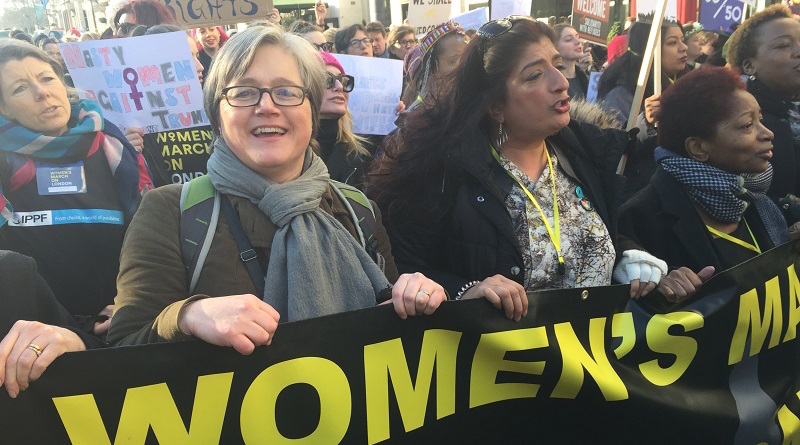 I was at the front of the march carrying the banner and inventing chaotic chants with Shola Mos-Shogbamimu, Bonnie Greer and Sajeela Kershi. It was wild, joyous and utterly exuberant and at the same time deadly serious as we protested the inauguration of a dangerous, sexist, racist misogynist as President of the USA. I was proud to represent the Green Party and to speak in a packed Trafalgar Square, while my daughter was still making her way from Grosvenor Square at the back of the march. “It is just amazing to see so many diverse and incredible organisations and people united in a stand for equality, dignity and justice. This feels genuinely unprecedented and historic. We now live in a world, where a man who has repeatedly demeaned women and people with disabilities and who has gloated about sexual assault holds the most powerful position in the world. What does it mean for the campaign to end violence against women and girls to have a misogynist president in the White House? We know that one in four women here in the UK have been victims of domestic violence. That every week two women are murdered by someone they are in a relationship with – or used to be. It’s heartbreaking and it has to stop. So in the face of Trump’s presidency, what can we do? We can, and we must, come together to stand up to the forces which seek to divide us. We must renew our strength to push for a society in which all people are treated as equals – whatever their gender, race, faith or sexuality. Every young girl deserves to grow up in a world where women feel safe, valued and respected. A world where they know violence against them is not acceptable and that it will not be tolerated.